H. C. Andersen is, according to many, the world's greatest fairytale narrator, and the "The Princess and the Pea" is one of his most popular renditions. This performance was premiered in 2005 and was intended as a tribute to the poet in the occasion of the 200th anniversary of his birth. ... ..
Theater Performance: If we carefully read the adventure, we discover that history has a sort of villain. For example, the queen does everything she can to prevent the prince from getting married. The queen's sovereignty becomes even clearer in the performance than in the adventure because we have made a frame story. 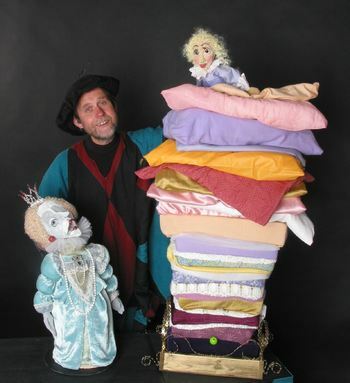 Here we meet the puppet theater player Adam Abel von Contrafei who travels from place to place to perform ... THE PRINCESS ON THE PEA! what the puppeteer, however, does not know when his theater performance begins, is that the queen has stolen the king's crown, thereby gaining the right to decide everything and everyone. Including the puppeteer! And now she forces him to build a mountain of mattresses and duvets, as well as placing a princess on top of it all. - Dread and horror! "Fortunately, Von Contrafei, with the help of the audience, rips the crown from the queen's head. And so the king gets his crown, and the prince is allowed to marry the princess. - Hip hooray! The play is performed in Norwegian.